In order to ensure this crusher running in high efficiency and having long lifetime, the users should meet the balanced feeding requirement. So a corresponding feeder is necessary for this jaw crusher. It is made up of frame, eccentric shaft, grooved wheel, flywheel, moving jaw, side guard plate, toggle plate, toggle backseat, adjusting screw, returning spring, fixed jaw plate and moving jaw plate. Toggle plate is of safety function. Jaw crusher adopts the electric motor as the power. The eccentric shaft is revolved by an electric motor through v-belts. It causes the swing jaw following the preconcerted path to crush the feeding material. Thus the material will be crushed in the crushing chamber which is composed of the stationary jaw plate, swing jaw plate and the liner plate. The material is discharged from the lower part of machine that is what you want. Please refer to the jaw crusher chart for more details. 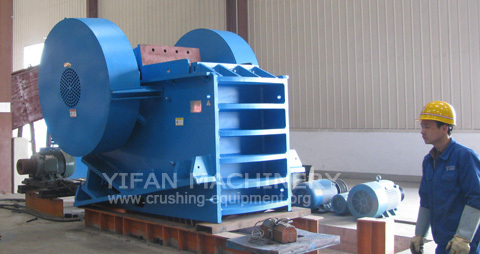 Contact a YIFAN engineer today for your jaw crusher inquiries.